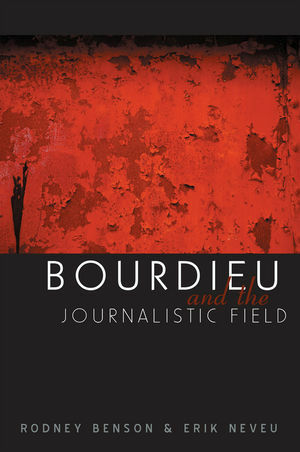 Bourdieu and the Journalistic Field is an exciting new text which builds on and extends Pierre Bourdieu's impassioned critique of our media-saturated culture. Presenting for the first time in English the work of influential scholars who worked with or were influenced by Bourdieu, this volume is the one and only book for Anglophone scholars seeking a more detailed elaboration of field theory in relation to the mass media. In his short book 'On Television', Bourdieu provided a powerful critique of the 'journalistic field', but what exactly does he mean by this? How does the journalistic field relate to external economic and political pressures? And what kind of autonomy can, or should, journalists expect to maintain? Such questions are taken up in case studies of such diverse phenomena as media coverage of the AIDS-contaminated blood scandal in France, U.S. youth media activism, and political interview shows on both sides of the Atlantic. Chapters by both American and French scholars also demonstrate methods for measuring field autonomy and spatially mapping journalistic fields, or discuss the similarities and differences between field theory, new institutionalism, hegemony, and differentiation theory. Rejecting all forms of dogmatism, the authors in this volume demonstrate why field theory remains a "work in progress," and indeed, a research paradigm whose promise has only begun to be tapped. The book includes an important and hitherto unpublished text by Pierre Bourdieu, 'Fields of Journalism, Social Science and Politics', and contributions from Rodney Benson, Patrick Champagne, Eric Darras, Julien Duval, Daniel Hallin, Eric Klinenberg, Dominique Marchetti, Erik Neveu, and Michael Schudson. Rodney Benson teaches at New York University. Erik Neveu is affiliated with the Institut d'Etudes Politiques de Rennes. Chapter 1 Introduction: Field Theory as a work in Progress - Rodney Benson and Erik Neveu. Chapter 2 The Political Field, The Social Science Field, and the Journalistic Field - Pierre Bourdieu. Chapter 3 The Double Dependency: The Journalistic Field Between Politics and Markets - Patrick Champagne. Chapter 4 Sub-Fields of Specialized Journalism - Dominique Marchetti. Chapter 5 Mapping Field Variation: Journalism in France and the United States - Rodney Benson. Chapter 6 The Contaminated Blood Scandal: Reframing Medical News - Patrick Champagne and Dominique Marchetti. Chapter 7 Economic Journalism in France - Julien Duval. Chapter 8 Media Consercration of the Political Order - Eric Durras. Chapter 9 Channeling into the Journalistic Field: Youth Activism and the Media Justice Movement - Eric Klinenberg. PART III : CRITICAL REFLECTIONS. Chapter 10 Bourdieu, the Frankfurt School and Cultural Studies: On Some Misunderstandings - Erik Neveu. Chapter 11 Autonomy from What? - Michael Schudson. Chapter 12 Two Approaches to Comparative Media Research: Field Theory and Differentiation Theory - Daniel C. Hallin. Builds on and extends Pierre Bourdieu's impassioned critique of our media-saturated culture. Includes case studies of such diverse phenomena as media coverage of the AIDS-contaminated blood scandal in France, U.S. youth media activism, and political interview shows on both sides of the Atlantic. The book includes a hitherto unpublished text by Pierre Bourdieu on 'Fields of Journalism, Social Science and Politics' and contributions from Rodney Benson, Patrick Champagne, Eric Darras, Julien Duval, Daniel Hallin, Eric Klinenberg, Dominique Marchetti, Erik Neveu, and Michael Schudson. Will be an invaluable textbook for all students and scholars of media and cultural studies, communication studies, sociology or journalism.